While I enjoyed this issue more than I didn’t, there were a number of characterization choices that kind of caught me off-guard. That said, this is the second issue in a row to go down this odd path, so maybe it’s not really “out of character” anymore. I don’t find Harley Quinn charming, because I don’t think “Kooky homicidal person” is any more interesting than it was in the 90s when those characters were a dime-a-dozen. Same reason I find Sanity to be probably the worst act in professional wrestling. And I honestly never realized that Batgirl spoke in nonsense like Harley does. So I really don’t find the Harley half of this plot at all engaging. 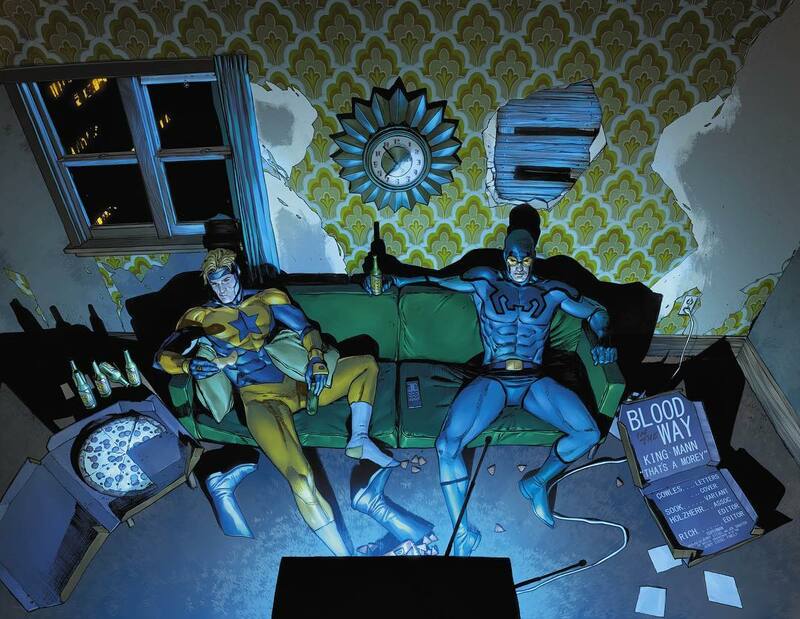 On the flipside, I used to enjoy Booster Gold, and I loved the Blue Beetle. But I find their arc in this story incredibly off-putting. Ted was such a conscientious character; I feel like they’re halfway there with his loyalty to Booster, but his nonchalance in the gravity of this situation just feels misaligned to what made the character endearing in the first place. I mean look at this opening spread — it’s beautifully rendered (and I admit I didn’t see the “Heroes In Crisis” letters until zooming out to this degree) but a bunch of heroes have just been brutally murdered and the casual nature of this just feels jarring. And the real tire-screecher in this issue was Superman’s speech. I didn’t find it bad—not at all—but rather just kind of surprising. It seemed to be answering a question that it hadn’t occurred to me to raise, and definitely not a question I’ve seen raised in the DCU. That said, it was thoughtful and poignant, and designed well enough that it made me reconsider and ponder my reaction, as opposed to just thinking “Well that was dumb.” Even though it didn’t necessarily land with me, I’m all for a writer committing to the world they’ve created and exploring where that leads. This felt like a natural extension of what King is creating, as opposed to some weird indulgence being shoehorned in where it doesn’t fit. And finally, we at least got a clue that things were not as they seem. Had Booster’s discovery not happened in this issue, I would’ve seriously considered bailing. The pacing so far has felt almost as indulgent as Brad Meltzer’s thirteen-issues-of-Polaroids / nothing’s-happening run on Justice League. 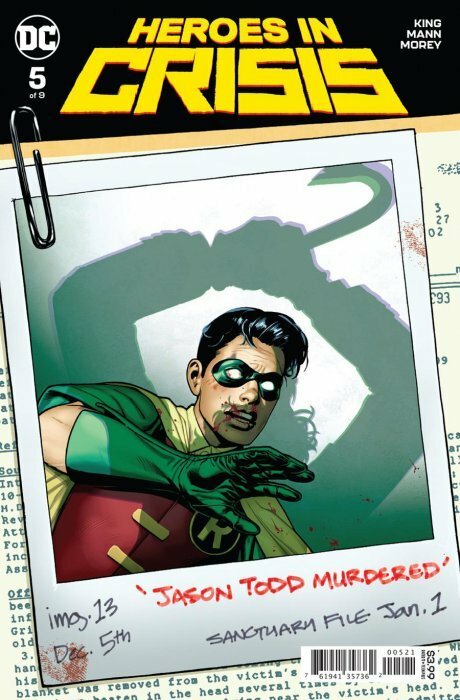 Speaking of Polaroids, I know “Teenager is about to get murdered” is not a good time for laughter, but this cover makes me laugh because really, in order for this Polaroid to exist someone needed to be like “Hold on, Joker – before you strike the killing blow, let me just sneak in between you and Robin for one sec… OK great, got the shot – please continue.” And then that Polaroid ended up in a case file too! 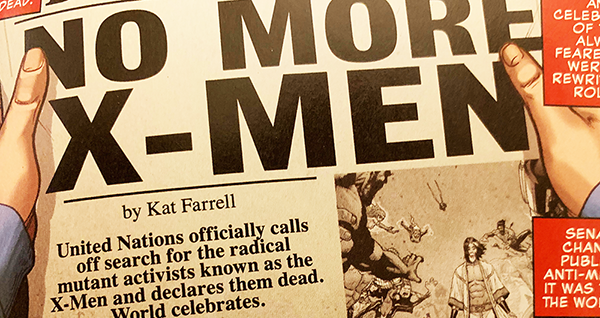 It reminded me of a couple weeks ago, in Uncanny X-Men #10, when Cyclops is reading a newspaper about how the X-Men are dead, complete with a front-page photo from the battle. Fortunately the Daily Bugle appears to have had a photographer on the scene, standing right in front of X-Man in the heat of the battle. That’s journalistic courage! This of course also reminded me of the laugh-out-loud scene in Final Crisis #7 when all of reality is falling apart and the final issue of The Daily Planet includes a photo of the remains of existence floating in the Bleed. That’s all that’s left. Speaking of people taking photographs in the middle of action scenes, I haven’t been reading any Superman comics in quite a while, but it was a really light week for me at the comics shop. 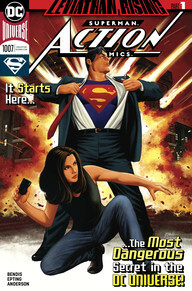 I decided to pick up Action Comics #1007, as it is the first issue in a new arc. Jimmy Olsen goes on a date and ends up at some lizard cult, where he shoots some photos with his iPhone that upset the lizard cult before it all blows up. Lots of snappy banter ensues as Jimmy has to explain why he’s sleeping on Perry’s couch. Lois Lane tells her dad that she’s married to Superman. Amanda Waller jumps off a building so Superman will save her. Then there’s like a big explosion or something and that’s it. Like I’m not even kidding—that’s the issue. I know that Brian Michael Bendis is notorious for decompressed storytelling, but I read this issue in two minutes. I read it again just to confirm that I didn’t do my math wrong, and no, it was two minutes and five seconds. This is ridiculous. Of course I’m not going to continue reading this. I don’t know how long they’re planning this thing, but let’s say it’s five issues – I’ll have spent $20 on ten minutes of story. 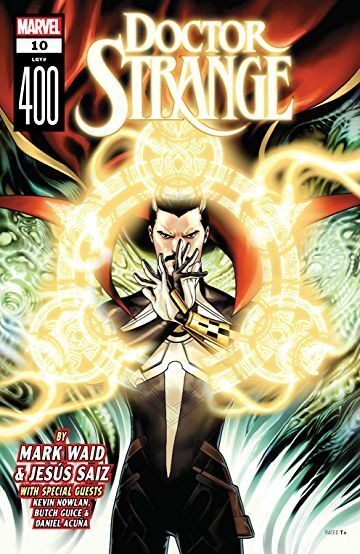 Speaking of Amanda Waller jumping off a building, that leads me to Doctor Strange #10 aka Doctor Strange #400. I also picked this one up because it was a light week, and also because I saw “Mark Waid,” “Kevin Nowlan,” “Daniel Acuna” and “Butch Guice” on the cover. Based on the fact this is a bonus-sized issue with several artists listed on the cover, I expected it to be the kind of issue that Fantastic Four #5 wasn’t. I was correct, and I’ll be jumping off as quickly as I jumped on. The lead story, while well-written and illustrated, was a little too cute for its own good. It reminded me of something Jason Aaron might write. Then the backup stories were nice little self-contained stories that would be charming in something like Marvel Comics Presents, but just felt like filler justifying the $5.99 cover price here. I enjoyed these short stories quite a bit, but since they’re the inconsequential fluff and not the main storyline, I know that issue #11 will continue the annoying cutesy story and not the backups, so I’ll pass. I was at a comic shop a few days ago and leafed through one of the Heroes in Crisis issues, but I couldn’t really figure out what was going on. What’s the general logline premise of that series? Wikipedia isn’t much help.